This is what we like to see when we check our inbox after a summer holiday. A colleague at the Norwegian Road Directorate attached this poster from the city of Trondheim in an email. 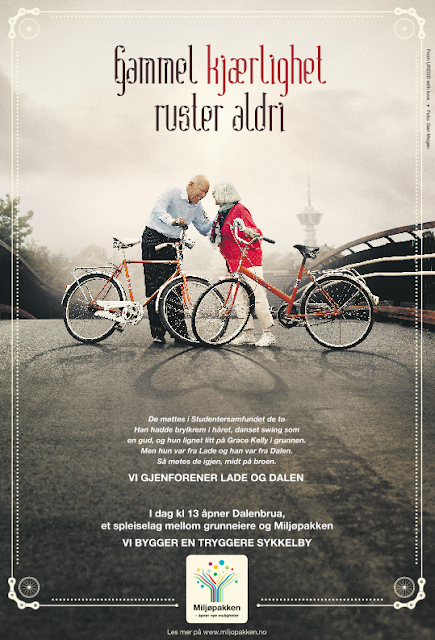 It advertises the opening of a new bicycle/pedestrian bridge in the city that links two neighbourhoods - Lade and Dalen. "They met at the Student Club. He had brylcreem in his hair and danced swing like a god. She looked a little like Grace Kelly. But she was from Lade and he was from Dalen. Then they met again, in the middle of the bridge." "We have reunited Lade and Dalen." 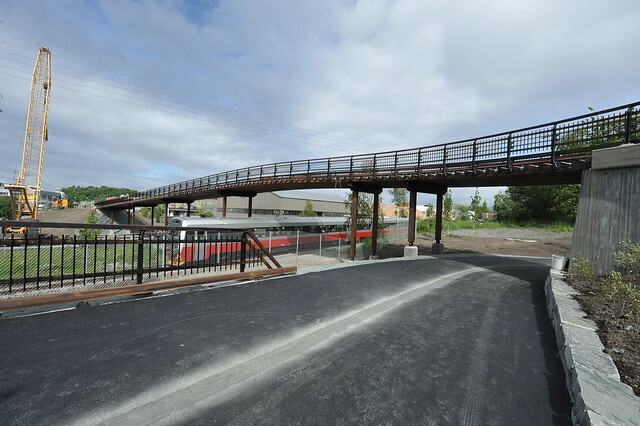 "We're building a safer and more secure bicycle city"
Two neighourhoods separated by railway lines and roads are now reunited, thanks to a new bridge - Dalenbrua. Mobility is improved. More convenient and safer for bicycle users and pedestrians. Not a dry eye in the house. Well done, Trondheim. The link was financed by the Miljøpakken - Environmental Package - with Trondheim city, Sør- Trøndelag County and the National Road Directorate. ﻿Miljøpakken was responsible for Trondheim being selected as Norway's boldest climate city in 2008. Seven billion kroner [€950 million] will be invested in new and better roads and environmentally-friendly transport. Miljøpakken will bring cheaper and faster busses, more sidewalks and cycle tracks, less noise, better traffic safety and thriving streets. Here's what the link looked like shortly before opening last June. Fantastic with the new 480 metre long bridge but right now we're loving the communication angle in the poster.